The Marxists of Democratic Socialists of America endorsed Barack Obama in 1996-and have backed him ever since. 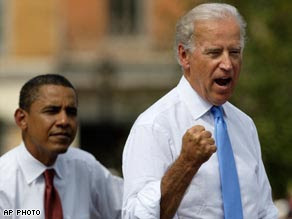 It appears they don't find his vice presidential running mate Joe Biden too foul either. He’s no Bernie Sanders or Dennis Kucinich, but Joe Biden is probably the best the left could have hoped for Barack Obama to pick as his running mate. A Biden pick means that the next Democratic White House will be relatively free from significant influence by the center-right Democratic Leadership Council (DLC). This would not have been true if Obama had chosen Hillary Clinton, Evan Bayh,Tim Kaine, Tom Daschle, Bill Richardson, Kathleen Sebelius, Mark Warner, Jim Webb, or Brian Schweitzer, all of whom are DLC members; or Wesley Clark or Chet Edwards, both of whom might as well be DLC members. Biden is by no means a socialist or even a social democrat, but his political perspective is informed by the traditional, center-left ideology of the Democratic Party. He understands the concerns of working class voters and has a strongly pro labor record in the Senate; he offers a sensible and realistic foreign policy perspective; and he has been thoroughly progressive on many social issues. His nomination for vice president should be hailed as true progress by the American left.